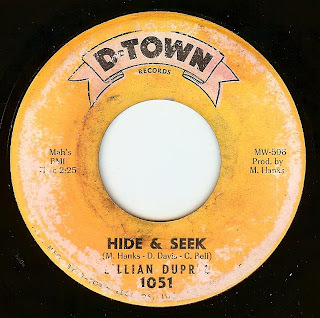 That said, I am proud to say that this is one of the rarest 45's in my collection, but it's SO GOOD. This was released right around the time that tiny little Swan records went belly up so more than likely very few got pressed. This song is yet another example of a song that with the right exposure probably would have been a massive hit. Yep, the same fella that charmed hearts with "Rockin' Robin" released this stormer about 8 years later! Born and raised in Ft Worth, TX, Bobby relocated to LA and became a member of the Hollywood Flames before striking out on his own. 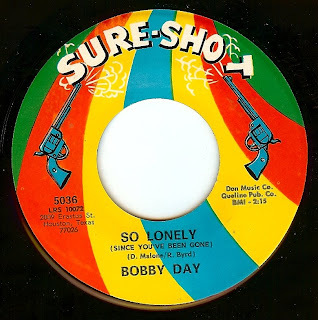 I am going to make a guess and say he was probably living in Texas at the time of this record, as Sure Shot was based in Houston (but I could be dead wrong). 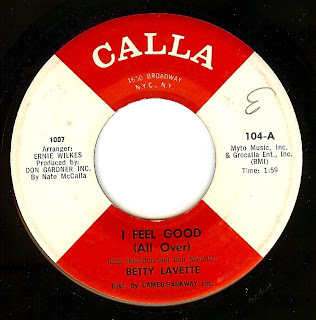 While it's a truly great thing that Betty has had something of a creative renaissance in recent years, her mid to late 60's releases are simply unbeatable; this is the type of record that could easily be used to demonstrate what soul music is for someone who hasn't a clue. "I Feel Good" is an intense, pounding and swirling number and 'Only Your Love" is a gorgeous and dreamy mid tempo number. An absolutely perfect double sider! A mysterious stomper! One of my favorite types of records to feature. 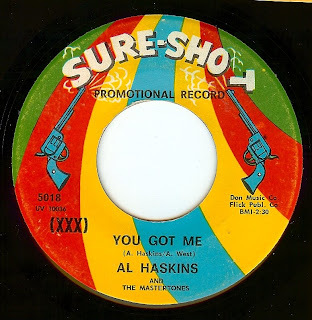 No one seems to know ANYTHING about Al; so many of the releases on Sure Shot records are a mystery but once again, the real story is in the grooves. Formed in London in 1965, this mixed race group of course scored a massive hit with "Baby Come Back". This follow up (a few singles later) shoulda been just as huge; pity that it wasn't. For folks in my generation, Eddy Grant was an early MTV hero with his still fresh "Electric Avenue" and here, 20 year old (listed as "Edmond") Grant does a fantastic job in relaying the tale of being true to one's love. 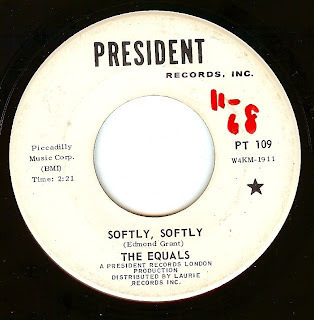 Very nice also that the name "The Equals" was a commentary on the fact that this mixed race band were all, in fact, "equal". 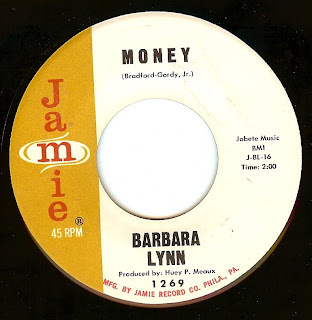 As though of you who have been following this blog for a while will know, I have a major thing for Barbara Lynn (and have featured just about every 45 she's ever released!). 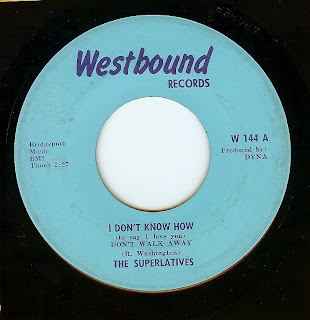 Sure, there's lots of great versions of this one, but Barbara does a great job stepping up to the standards of Barrett Strong and The Beatles. This version is unique in that the intro is so complex but funky. And that's a hard tightrope to balance upon! It's just too bad she doesn't have a guitar break in this one because she would have torn it up, alas. 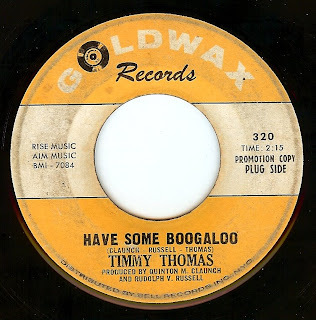 This is the killer debut single from Indiana born-relocated to Memphis (at the time of this record)- then eventually ending up in Florida (where he had a massive hit with the incredible "Why Can't we Live Together") Timmy. I love how the rhythm box and the drummer go out of sync in a few spots. Think that would be allowed in a modern record????? 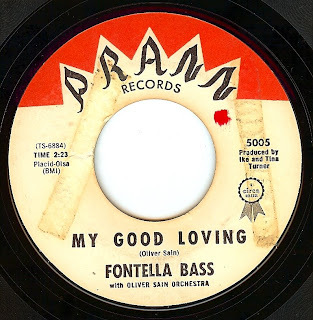 Before her move to Chicago and subsequent signing with Chess records, St Louis native Fontella Bass worked with artists such as Little Milton, Ike & Tina Turner (the Ikettes back her on this track) as well as musician/produced Oliver Sain. This powerhouse of a song was recorded shortly before her move to Chicago. What a voice! 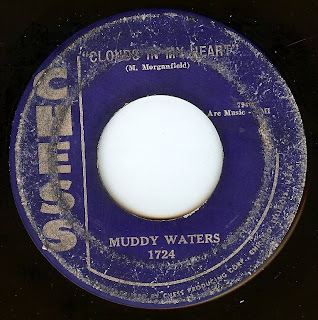 While Muddy's 45 releases from the late 50's-early 60's era don't seem to get much respect by historians for some odd reason, this intense, sublime track is a favorite of mine. Especially when those drums kick in the way they day halfway through the song. Wow. While I tend to not be that interested in most of the 60's music I've heard from continental Europe, but this song from Dutch singer (and later TV celebrity in the Netherlands) definitely won me over when my girlfriend introduced it to me a few years back (she performed it in her former band, The Deccas). It proved EXTREMELY difficult to find, but I'm glad it has a new home. 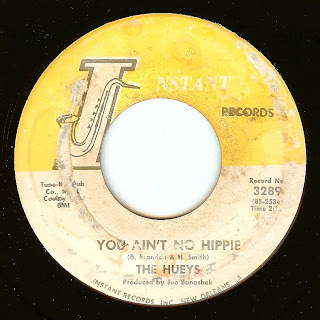 Interestingly enough, this particular version of the 45 credits the group as 'Unit Gloria". From all I've read, Unit Gloria was founded a few years later. This pressing, is in fact, a later edition where "I Surrender" was used as the b-side of one of the most atrocious glam-rock style songs I've ever heard! Couldn't make it through even two minutes of it. 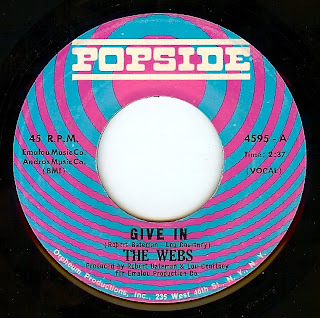 Another incredible song from the Webs and (in the producer's roll) Lou Courtney. 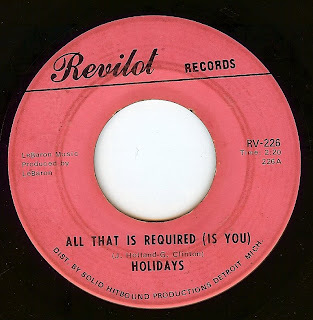 The b-side ("So Hard To Break A Habit") of this is great too; more of an intense deep soul track. Because of bandwidth limitations these days I have to be cautious with posting both sides, so if you wanna hear it, shoot me an email. 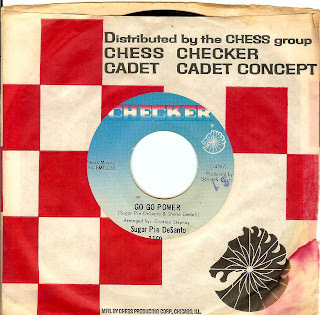 There is really nothing I can say about this track other than GO GO GO GO GO GO GO! 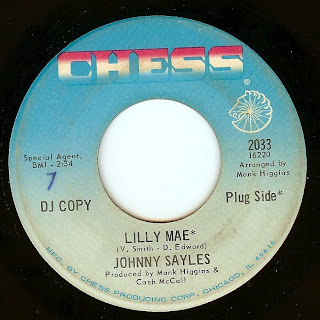 A stunning track from Texas born-relocated to Chicago singer Johnny Sayles. 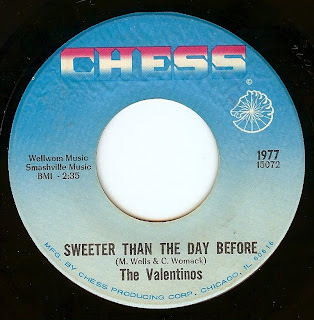 Very much in the vein of Otis Clay, this track is the epitome of the Chicago hard soul/ nascent funk sound. 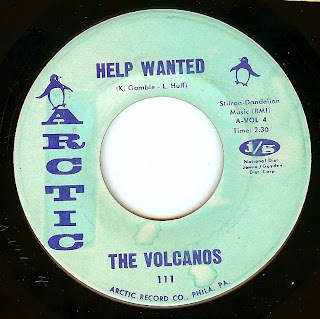 Yet another great track from this criminally overlooked Philadelphia group (i featured "Storm Warning" from these guys previously). 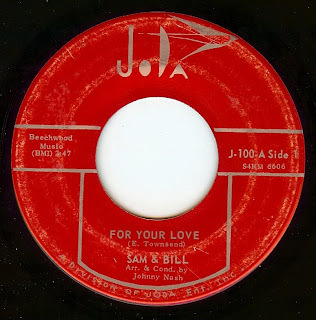 This track, in addition to simply being ultra cool, is also an early collaboration between Philly legends Gamble & Huff. 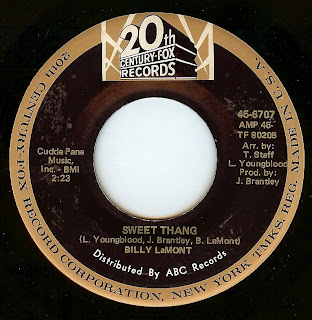 Wish I knew more about this one, but I guess the real story is in the grooves of the record. 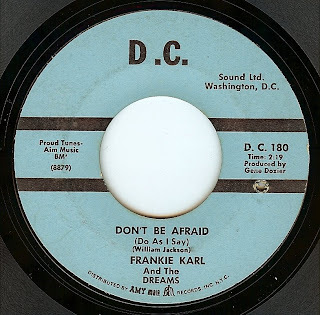 Interestingly enough, this record is on the "DC" label (as in "the sound of Washington DC") but I have read that this record was cut in Los Angeles, after Frankie was released from the military. Hmmmm. 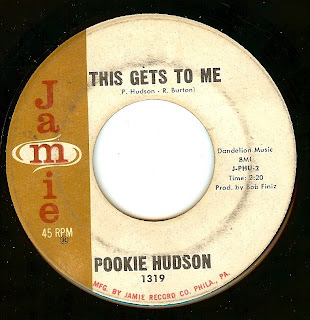 Frankie had an interesting story that included being part of a gospel vocal group (The Cogic Singers) which included not only Billy Preston but Gloria Jones as well. This track is the epitome of a type of smooth sound that I just love. This one was under my radar until my friend Jeff Jagged found a copy a few months ago and hipped me to it. Luckily, it proved to be easy to find as it was a minor hit. 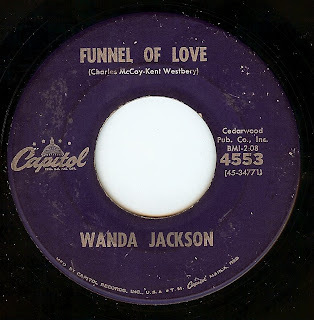 Yesterday I had a very friendly request for something by Wanda Jackson, and who am I to say no to a request like THAT? In a very brief nutshell, Wanda is from the sticks in Oklahoma, and when she was young her family moved to California (her father was a musician) but shortly afterwords they ended up back in Oklahoma (City). Country star Hank Thompson discovered her around 1954, and she cut was signed to Decca and cut some lovely western numbers and found herself on the road (and dating) Elvis Presley in 1955 who encouraged her to cut some rockabilly. Not only did she cut some sides, but she became the queen. THIS track, however, is unlike anything else really. 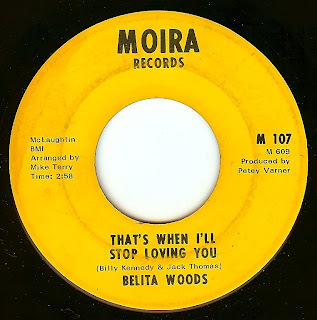 Although it was relegated to a b-side, this song has taken on a life of its' own and is hugely popular on the r&b oldies club scene (especially popular in Belgium where songs with the so-called "popcorn" beat are huge. I find this song to have much more in the way of CHUTZPAH than most of the popular popcorn tracks, though). Allow me to brag and say that we got to see her do this one live in new Orleans a few months ago, with stellar backing by Deke Dickerson and The Ecco-Fonics. Hot stuff indeed. Right from the opening riff of this song you just KNOW it's gonna be a heater! I know nothing about this group other than it's a New Orleans cut and that I have a few more by them but this one is by far the best. The sneering putdown lyrics are a gas, too. As always, if you have any additional info, please write! Belita has been a part of the P Funk gang for the last 15 years or so, and her voice is truly a thing of wonder. This is an absolutely gorgeous duo ballad from these New Jersey fellas. They have a few more releases that I understand are also great that I need to find. 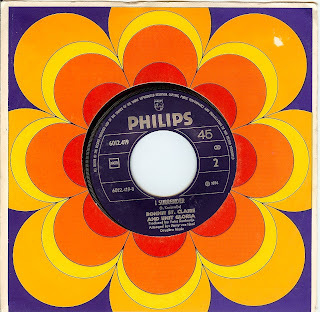 Of course this Dutch group struck a huge national hit with "Venus", but today's featured tracks is one of the greatest fuzzed out freakbeat numbers ever. Notice how today's scan is not of the label; this pic sleeve is too nice to not feature! I'm typically not that hyped up about picture sleeves, but this one from Japan is an exception. 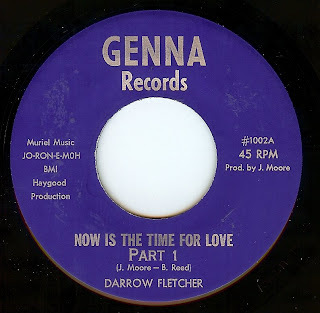 It's no secret how much I dig Darrow, if you've been hangin' around this blog for a while. 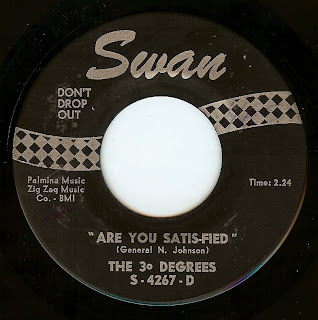 This was one of those notoriously tough to get 45's but hell yeah it was worth the wait. 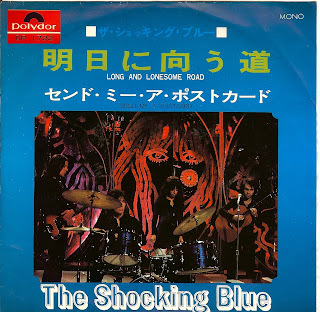 Psychedelic soul at its' best. Part two is really cool (just keeps the jam going) as well; if you wanna hear it I'll email it to you.